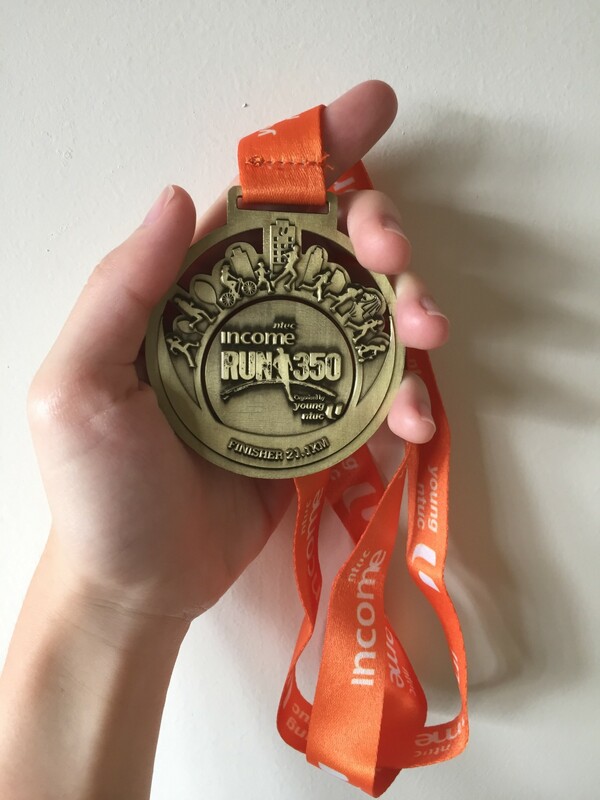 Race Review: RUN 350 2016 [Half Marathon] (by RunYourPace) | JustRunLah! 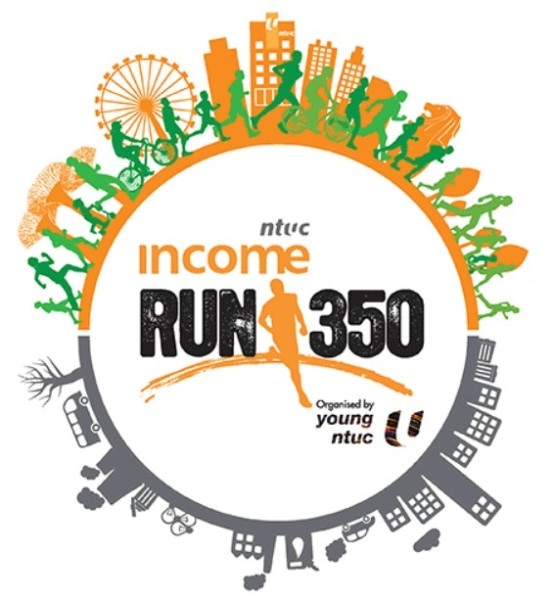 Over the years, RUN350 has grown to become one of the largest running events in the Singapore running calendar. It happened to be our first ever running event together 2 years ago, so you could say that this event was especially meaningful to the both of us. 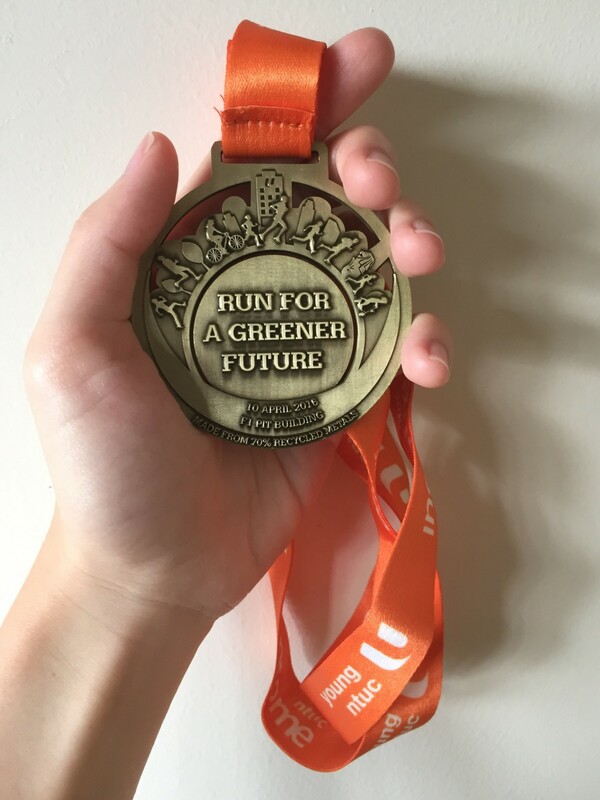 As this was an eco-run, there was also an effort to promote a more environmentally friendly lifestyle. The organisers encouraged participants to lower their household utility consumption by rewarding those whose consumption level was below national average with NTUC vouchers. Furthermore, to reduce our carbon footprint, there were also shuttle buses available for participants (at a fee of $6) to get to the race venue. Kudos to green living! Flag off for the half marathon category was 5 in the morning. A little too early for our liking… But I suppose it does have the benefit of avoiding the heat before the sun starts rising ☀️. As for most races we join, we brought along our own bottles. The eco-friendly organisers of this run also encouraged participants to bring their own bottle to reduce wastage of paper cups at water points during the run. We arrived at the race site around 4.30am. Although the queue for the baggage deposit was pretty intimidating, it was fast and efficient 🙂 However, we waited around 30 minutes for the porta-potties!! While queuing we could hear the first, second and third waves being flagged off 🙁 I guess we should have heed the advice of the volunteers and go to the porta-potties that were located nearer the starting pen. By the time we reached the starting point, everyone was already flagged off so we had to unceremoniously flag ourselves off (de-javu to our first run350 race). As we were not part of the big crowd that was flagged off earlier, running with only a few other people around, did feel quite relaxing. 😌 The weather did not feel as hot and humid as the past few days in Singapore, probably because it had rained really heavily the day earlier. With my earphones plugged in, I was completely zoned out from my surroundings and focused on my run. I remembered that my HM at RUN350 last year went quite badly as I wasn’t very ready physically as well as mentally. Back then, I had told myself that I was not strong enough for the race and wouldn’t be able to complete it well. Unfortunately, whatever I told myself came true as it turned out to be a pretty bad race for me. BUT, this year I was determined to not let this happen again. I know the pains and aches will come, but this time, I was excited for it. I was excited to push through the pain and complete the race even stronger than I had started! The first 10km seemed to flash by pretty quickly and we were on a pretty decent and consistent pace of 7mins/km. It’s always nice when races have distance markers on every kilometre of the route but we started to realise that the markers were getting about 500meters off the distance shown on our GPS watches as early as the 3km mark 😨 It was probably quite misleading for those who relied on these markers.. Most of the route was relatively flat with just a few short up-sloping areas. There were however, several areas (Tanjong Rhu Road) that was fairly narrow so we had to slowly weave through the crowd, careful not to bump into anyone. Thankfully, there was no bottlenecks throughout, even when we started behind all the waves. After getting out of the narrow stretch at Tanjong Rhu Road, the route led us along the perimeter of the Marina Bay Golf Range, before a small part in Gardens by the Bay. They were giving out bananas🍌 along this stretch, but we decided not to stop for one. As much as possible, we try to avoid breaking our momentum. As we turned out of Gardens by the Bay towards Marina Barrage, I started to feel the fatigue setting in, first with my knee pain and then my worst enemy – the runners “stitch”(that niggling pain in the abdomen) >< Usually, I would just give in to the pain and slow down. But I thought it would be such a waste because we were going so well and I didn’t want to let Kang Jing down, so I decided to press on. The pain just got worse and worse as we carried on running, but the worse it got, the harder I decided to push myself. I was very determined this time not to let this ruin my run (I was also thinking if it was possible to die from stitches). At about 17 km, I checked the time on my watch and realised that I wouldn’t be able to reach my goal of sub 2h30min if i kept running at the current pace. I told myself, “It’s okay, I’ll hit my goal next time.” However, I realised I had been telling myself that for every race and that’s why I could never achieve my goal 🙁 It had to be THIS time. I started running faster and faster and at the 20th km, I had reduced my pace to 5min 40 s/km. The faster I ran, the less focused I was on the pain and it seemed to have gone away! My GPS watch showed 21.1km as I was running past the floating platform but it seemed like there was about 800 meters left to go before the end point 😱. Alas, I was just 1 min and 38 seconds off my goal. At the end point, we were handed our medals and finisher tees, along with a banana and a can of 100plus. However, there wasn’t any bottled water given out. Runners have to go to a hydration booth to get their drinks. Interestingly, when we ask the volunteers to help us refill our bottle, they insisted that they cannot pour into our bottles and they could only fill the cups… so we had to take the cup to fill our bottles then ask them to fill that cup again so we could pour it into our bottle, which I thought was quite silly because the organisers were advocating runners to bring our own bottles instead of wasting paper cups. But then again, they could be conserving the water supply to ensure it wouldn’t run out. Overall, Kang Jing and I both agree that this is one of the most memorable races we’ve joined so far. The finisher tee looks and feels so good! This year the apparel sponsor was Mizuno and I’m honestly really impressed by the quality of the material. Doesn’t the medal design look so cute? On the medal, there is also an engraving which says “made from 70% recycled metals”. Generally, the organisation of the event remains impressive in my opinion despite some minor hiccups that we faced. And that marks the end of our eventful and enjoyable 3rd RUN350. I believe in the Run350 movement of creating a more environmentally friendly way of living. Doing your part, such as recycling or bringing our own bottle during these races, does make a difference to the environment. We will undoubtedly come back again for the race next year!! You can read more at www.runyourpace.wordpress.com and follow us @runningmypace on Instagram!